This is an attempt to draw a scene instead of just a person’s face. Of course, there is not going to be much detail in a drawing that’s only 15 cm wide and 21 cm tall. What’s in the drawing will be more an indication than a sharply marked drawing. 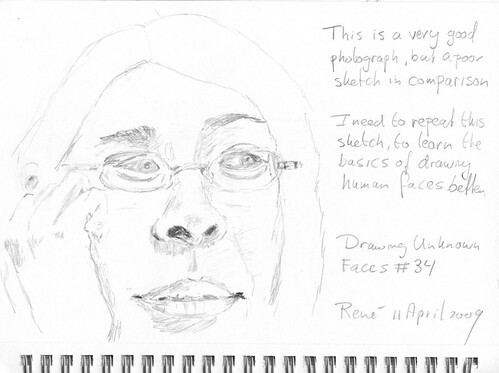 The sketch is based on a photo from the Flickr public timeline. 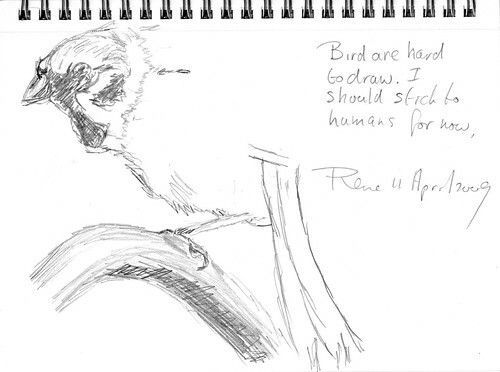 Alright, I tried to sketch a bird, and lost confidence. I’m just not used to all these feather. I hardly see birds at such close distance, because I have cats and those go well with birds. 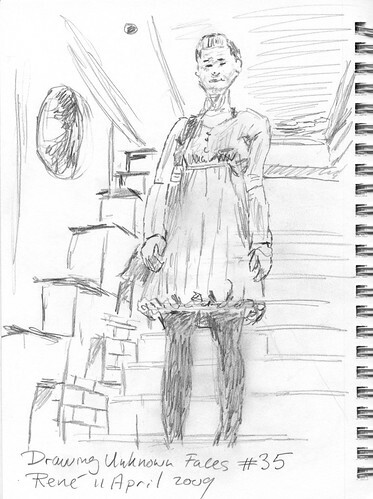 This sketch is based on a photo put on the Flickr public photo stream. In my previous sketch I had a lot of problems putting the parts of a face in the correct place and at the right scale. 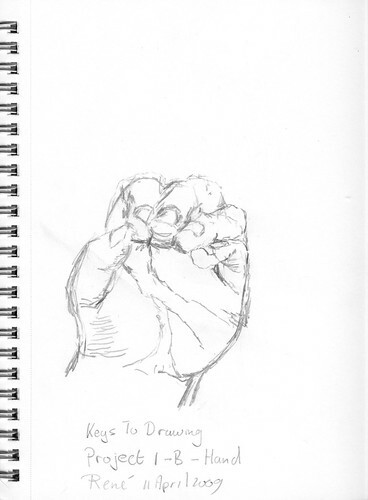 I wanted to know why that was, so I returned to an exercise from the book “Keys To Drawing” by Bert Dodson. The exercise was to draw your left hand (or right hand if you’re left-handed), with the fingers pointed towards you. The purpose of this exercise was to learn you to see foreshortening and how it does not conform to how we think a hand should look like. I was finished in less than 15 minutes, while the instruction clearly stated that you need to take at least 40 minutes to complete the sketch. So, that seems to be the problem. I’m rushing through, instead of taking my time to observe and take the visuals in. I need to slow down. Drawing isn’t about speed, but about concentration, and for old fogies like me, concentration takes time. I’m not as fast a thinker as I used to be in my twenties. As an aside, this is the best sketch in the series so far. Obviously, my drawing skills have progressed. However, that doesn’t mean I should be over-confident. Each drawing and sketch deserves full attention of the creator. The photo I used as a reference was a very good one. However, my sketch was not. So I decided not to complete the sketch and leave it in this state. I will try to make another sketch of the same photo once I have figured out why I suddenly seem unable to draw. The sketch is based on a photo I grabbed from the Flickr public photo stream. I hadn’t watched Leo Laporte on his TWiT Live video stream for a while, so I decided to have a quick look. And guess what, it got stuck. Now this may have been a quirk of VLC player, or any other of the many possible causes a video stream stalls. Whatever the cause, I decided to made a screenshot and draw Leo, to see if my skills had somewhat improved. 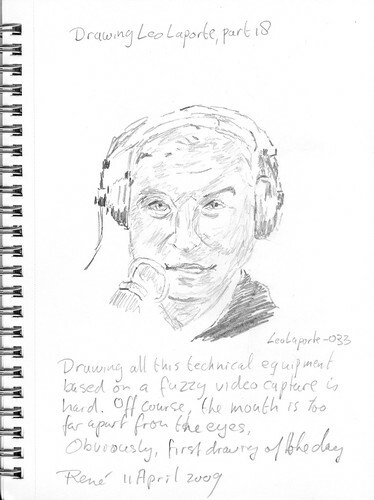 Drawing all this technical gear based on a fuzzy video capture is hard. Of course, the mouth is too far apart from the eyes. Obviously, first drawing of the day. I made this sketch yesterday evening after I’d said I was done drawing. Someone had made a Spring photo with some flowers and a bee on it. 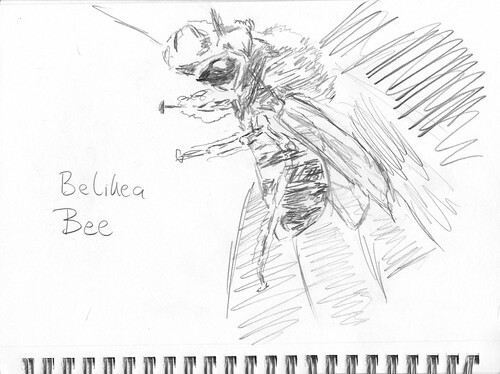 I enlarged the part of the bee (which became fuzzy) and decided to make a sketch.